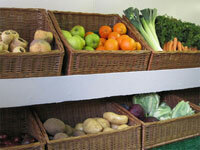 Locally grown fresh seasonal vegetables are delivered every Tuesday & Friday by L.B. Stewart & Son from the neighbouring village 0f Bromham, Beds. Local soft fruits are also available in season from R.Payne, Hanslope, Bucks.